A featured artist at Austin’s prestigious Davis Gallery, painter Chris Chappell has been lauded by many for his sublime representations of everything from the magical to the mundane. Now his work has a dedicated soundtrack. 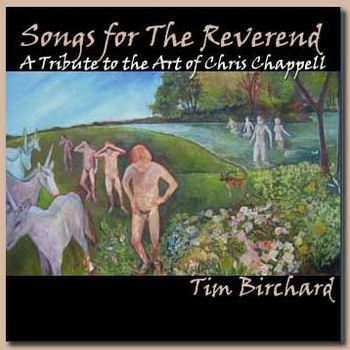 With Songs for The Reverend: A Tribute to the Art of Chris Chappell, Colorado musician and Austin native Tim Birchard offers a glimpse of Chappell’s art, life and psyche through the lens of his music. Inspired by Chappell’s rich portfolio and drawing from his own first-hand accounts of his friendship with Chappell that began nearly 20 years ago, Birchard offers a 12-song collection that weaves and staggers its way through rock, Indian raga, freak folk, jazz, country, psychobilly, metal, and classical neighborhoods, ending up, quite literally, at Chappell’s hall closet door. Written and recorded by Tim Birchard, copyright 2008. Mastered by Scott “Scooter” Smith at Scooter’s Place, Durango, CO. Available for digital download at www.timbirchard.bandcamp.com. It is a fact that Chris for a period of time was employed by Pier One Imports, once located not far from the intersection of Ben White and Manchaca. It is also a fact that one day my step-mother (who lived in a different town and had never met nor heard of Chris) happened to be shopping at that very store during one of his shifts. It may or may not be a fact that memorizing said address was part of the requirement when borrowing a friend’s driver’s license to illegally buy beer. 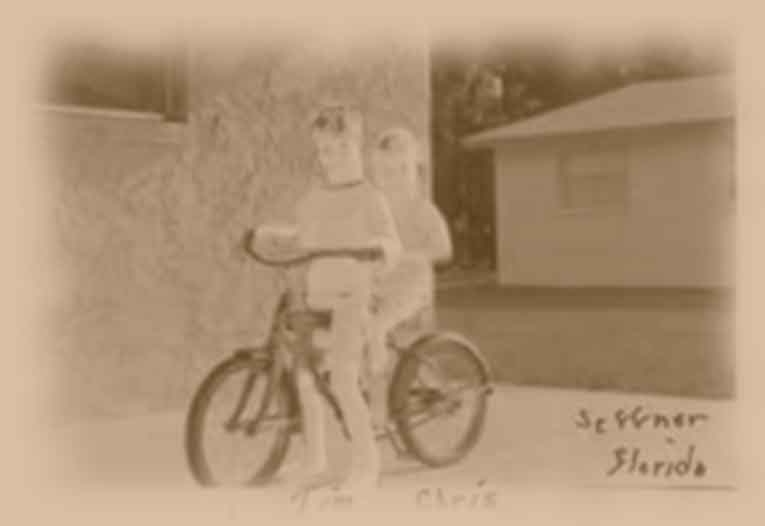 It also may or may not be a fact that the evening cashier at a certain 7-11 convenience store compared the photo on the identification card presented by Chris with Chris’ actual face, and challenged Chris on his identity. Only by snatching the card out of the attendant’s hand did Chris make it out of the store with dignity somewhat intact. Hudi, it turns out, can be found throughout Chris’ artwork. He’s prominently featured on the cover of the cd, almost serving as a watchdog for the males who don’t see the women coming yet, but whom have just heard about their imminent arrival on the scene and seem to be experiencing the end of innocence. (That’s my take, anyway.) He’s also in other paintings and photos. And his tail is usually pointing up. Even when he’s busy breaking the law, he’s a happy dog. The version of the song that made it to the cd is actually the second version. Initially this song was built around snippets of an actual 1989 cassette recording of Chris and me having a conversation. I crafted what I thought was pretty much the ultimate song, and sent it to him. He was horrified. So I went back to the drawing board and created something a bit less threatening, which passed with flying colors. I have since mailed Chris the only existing copy of said cassette recording, and I have every confidence that it has been utterly destroyed. Maybe that’s just as well. I’m not sure that there’s really much else to say… if you visit the link above, you’ll get the entire story. I will say that during the recording of the piano part, I felt particularly challenged by keeping a steady tempo. No matter how many times I tried, I kept rushing the very last chord of the whole song. I don’t remember how many takes I did, but I kept over-anticipating and playing the final chord too early. I have tremendous, outrageous respect for keyboardists/organists such as C. Scott Hagler, who make it sound so effortless and flawless at the same time. Finally, if we think of the narrator of the cd being the character with the vocal distortion (Fish Tank Blues, Still Life, Hudi Goes To Court, etc. ), and cute little Michael Schliefke The Squirrel as telling the story of Human In My Yard, then this final song serves as a sort of epilogue. The ending is abrupt; just as abrupt as the ending in Part 1. I thought about fading out, etc… but every time I listened to it, it just sounded right to me. There’s the tiniest bit of echo… more of a slapback echo-sound, at the very end, as the sound is dying out, and I just loved it. So I left it. I love the fact that we can choose to present some line, some lyric, as a factual statement. 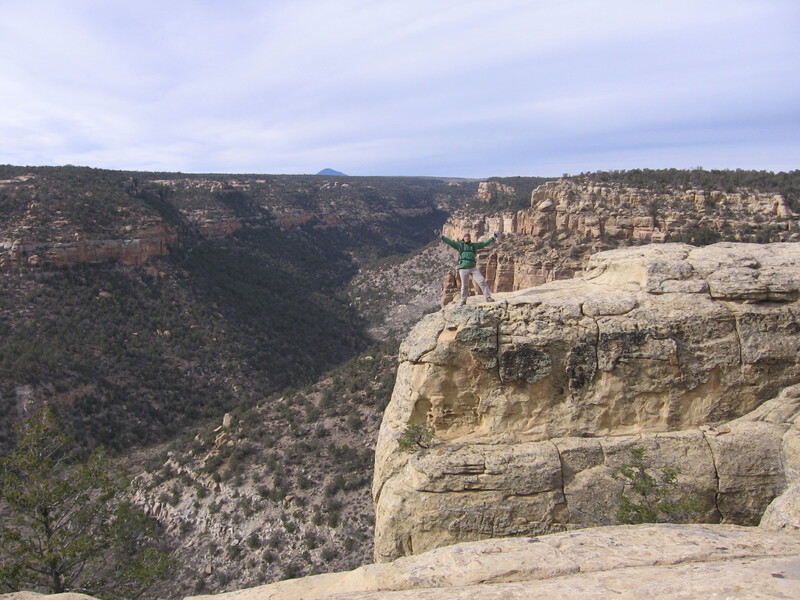 I have no idea how the line, “We’re headed for the cliffs, best grab your paper wings” came about, but now to me it’s become one of those old sayings that we’ve heard over and over. Except we haven’t. That cracks me up. I do remember that the evening I tracked the vocals for this song, it was pretty late and Cheryl had already gone to bed. I didn’t want to wake her, or the neighbors, so my initial plans of singing an octave higher, with more volume/energy, would have to wait. But I had the lyrics and the melody was coming out, so I decided to lay down a scratch track, which would be very quiet. After the first pass, I realized I was onto something– that this delivery gave the song more of a personal and intimate feeling. Less ‘canned’ and ‘prepared.’ I struggle with that to this day… “Okay, now I’m going to sing it as if no one is listening. What is that supposed to sound like? Oh, maybe it sounds like this. Okay, here goes…” It’s one of those great ways of self-protecting. I remember only one occasion while working with my vocal coach in Texas that I went to a truly vulnerable place. She’d been working with me for weeks, and one day we finally got to the ‘wall of resistance’ and for just a moment I let it all go– I closed my eyes, opened my mouth, and just let it come out, even though I was terrified that she’d laugh at whatever it was that came out unedited; uncensored. She did NOT laugh. But neither did she realize that I needed a moment to figure out what had just happened. I needed to figure out how to reproduce that; how to ‘go there’ again and again. Just like in 7th grade when I finally figured out how to do a gainer off the high-dive at the swimming pool; I had to do it 100 times in order to prove to myself that I really had done it and could do it again. But she didn’t know that. And she immediately tried to move to the next level; “Okay, now with your eyes open.” Well, that was like asking me to go from hopping on one leg to entering a slam-dunk contest. I wasn’t ready, and it was obvious that the little sliver of vocal magic I’d just experienced was once again cloaked by my fears. I still struggle with that, and also with the fear of not being heard. I always forget that one of the best ways to get people to listen is to speak or play quietly. While doing an open mic in Takamatsu City, I sat and sang a couple of songs, and people were for the most part chatting. Then I did this instrumental jazz piece that I put together over months (in front of the laundromat, waiting for the dryer to stop) and little by little the audience started listening. By the end of the song, not one person was talking. I was blown away– I’d had no idea that could or would happen. So I guess, in a sense, putting on my paper wings and heading for the cliffs can be just as transformative as it can be self-destructive. Two sides of one coin? Or is it all transformative… with the goal of destroying ‘the self’ at the core of this journey? One more thing: the guitar sound. I was trying to vary the sounds from song to song so as not to fall into a rut. It’s a pretty simple I-IV-V progression and the sound is okay. I like that it mixes things up, but I think it could’ve also sounded good with straight, unaffected acoustic. This is one of my favorite songs on the album. Tori Amos talks about how each of her songs is like one of her little girls, and that they all grow up and take on a life of their own. I can relate, and in that sense, I don’t really have a favorite. But in another way, this song just really fits well… like that favorite beat-up leather jacket that makes me wish fall would hurry up and get here. I confess that I feel a great sense of pride in knowing that I only used my CA acoustic guitar for all guitar parts on the cd, including this solo. I DO want to have an electric again… perhaps a Paul Reed Smith or another Telecaster… but since I just got a new chainsaw a couple of weeks ago, that’s probably going to have to wait. Cheryl wasn’t into the solo, but I just wanted to keep it. I asked her to help me come up with some lyrics. Time went by and we each had a few ideas, but nothing really stuck. The melodies that we kept coming up with were mirroring too closely the keyboard melody. And that wasn’t working for me. I started working on The Reverend, and it occurred to me that I had this one song almost done, just looking for a home. I brought it out, handed it a sandwich and a cup of coffee and invited it to sit and chat for awhile. Kindly it accepted my offer, and we sat and shot the breeze for awhile. I took notes while we chatted and the next thing I knew, I was tracking the vocals because the new lyrics were written. Yet again, this song is very autobiographical, which isn’t really that much of a stretch, since I imagine that most labors of love involve lying awake in the middle of the night being pulled between the need to write “just one more page” and the need to fall beyond the abyss into sleep. And yet again, I’m amazed at how much I enjoy the way the lyrics tie together with the music and capture that struggle, for me. It’s almost as if I’d gone into a trance, and when I came out of it, I was playing back some new song that I’d never heard before– like someone snuck in, bonked me on the head knocking me out cold, wrote and recorded a song, and when I came to, I was the one holding the pen in my hand. I don’t think I could have planned it to work out this well… it somehow just unfolded this way. I believe there’s an entire spectrum that lies between being in touch with my feelings and being completely alienated from them. Like the asteroid we see at the beginning of Eraserhead… cold, dead and disconnected. For me, that’s what this song is about– someone whose words and actions are completely at odds with one another. Chris’ sense of humor, in my opinion, can be quite sardonic at times, and very tongue-in-cheek. One day not too long ago, we were talking and he was giving me a bit of a rough time for being one of those people who are in touch with their ‘tender little feelings.’ It cracked me up, and that catch phrase stuck in my head. It got me to thinking about what a character might sound like if he were trying to be in touch with his feelings… trying to move from self-alienation into self-integration. How mismatched would his words and behaviors be? What might he do and say, in the name of being more self-aware? What does that uncomfortable journey look and sound like? I had so much fun pairing the music and the lyrics… it’s probably painfully obvious just how strongly influenced this is by ChromaKey, especially “Permanent Address”. Upbeat lyrics set against a backdrop of… something other than upbeat. laundromat, do some performance art”… Living in Hyde Park in Austin, I actually used to go do my laundry right next door to Quackenbush’s, sit outside and play my guitar. And once I made a joke to my theater friends/colleagues about how I’d done a performance piece– they were all excited and wanted to know the details– I told them I took some clothing to the laundromat, washed them in the washer, then moved them to the dryer and dried them… all to make an artistic/social statement about the current state of affairs and to speak out against the patriarchal, hegemonic, heteronormative, capitalistic isolation so many of us suffer and perpetuate in U.S. society. They didn’t think it was funny. At all. Just sort of looked away and went about their business. 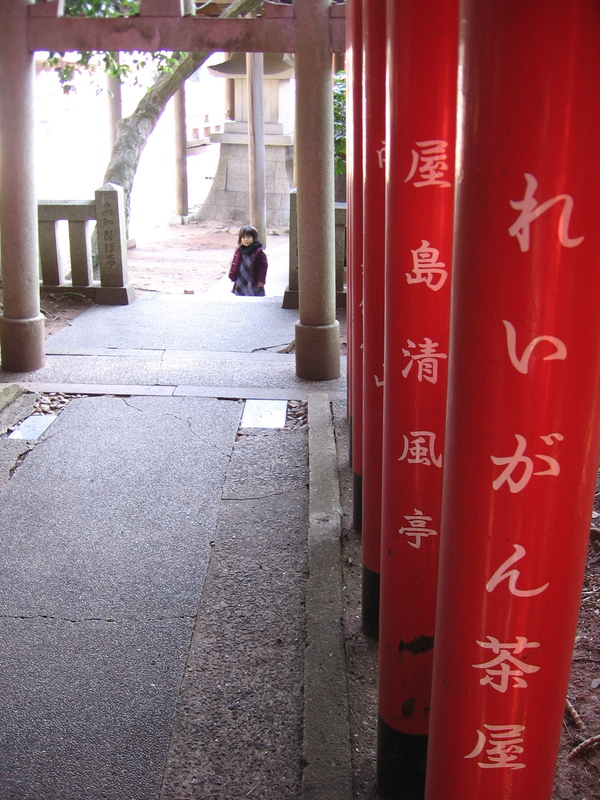 I was left standing there looking around. Which, I think, is kind of funny in itself. For the record, I am painfully aware of the seriousness of all those issues. It was the ‘performance piece’ aspect I’d been trying to poke fun at. I’d been TRYING to articulate and highlight the blurry and vague line between ‘performance art’ and ‘not performance art’. Who’s to say that my trip to the grocery store is something OTHER than performance art, if I deem it so? Who decides whether my actions qualify as performance art? And furthermore, if the distinctions are that subjective, what is the value of performance art? OR, is that the very beauty and value of performance art– that we can blur the lines so much that it’s hard to tell where the play ends and reality begins (a la, “Not Clown”)? Since I never majored in theater, I’m probably not the best person to listen to on this subject. However, I have experienced some amazing Theater of The Oppressed (Boal) and it has lead to some ‘a-ha’ moments. And I do believe it can help us bridge the gap between self-isolation and self-integration, in the right contexts. My other favorite part is the little ‘ping’ sound right after “maybe I’ll get my shovel.” I’d totally thrown that in on a whim, before even recording the vocals. And then not once did I try to plan out any sort of coordination between the vocals and the placement of that little sound. After tracking the vocals I went back and listened and nearly fell of my chair laughing when I heard it. It surprises me every time I listen, just how well it works. This, more than anything else, reflects much of how I work in the studio– there’s a basic structure, then there’s free-flowing improvisation, and I step back and see if it’s something I like. I’m always amazed and grateful when something comes out sounding cool to me. I have to wonder just how much of it is actually ‘mine’, and how much I just reached out and grabbed from the ether. 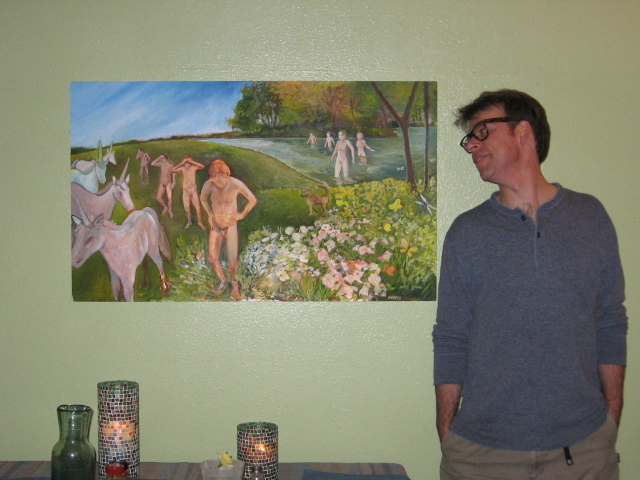 So the connections here are between Chris Chappell and Michael Schliefke, both Austin artists who have been collaborating for years, as well as Michael’s disdain for squirrels and Chris’ love of them. Once I saw all of this juicy material, I knew I had another song. This one is a squirrel’s-eye view of life, and gives our main narrator a break in the over-arching story line of the album. I love the idea of a squirrel who is sick of being a squirrel and dreams of being something “more special,” like a unicorn. So he trains every day and even ties a little unicorn-horn hat onto his head with a piece of string, hoping one day to compete in the Unicorn Olympics. I seriously see a children’s book here just waiting to be written. I wonder if I’ll ever be able to talk Chris into actually sitting down long enough to do all of the storyboarding and artwork that would be involved. If I could hope for just one magical little pop song, this is probably it. I think it’s the happiest, bubbliest thing I’ve ever done– ‘the friendliest pop song you’ll ever hear’. Hey Michael Sweet, let me know if you’re interested. Maybe there’s a feeling of hopefulness in the swirling pool of metal, taillights, exhaust fumes, starkly-lit billboards, ongoing madness in the night. Times like this, I do remember those golden summer days as a kid, my bike with the banana seat, running through the sprinkler. The mention of the drive-thru is a tip of the hat to an old friend whom I’ve fallen out of touch with. We flipped burgers as teenagers at the same greasy restaurant in a little Texas town. We went to concerts together, we grew up together, and I’ve always thought of him as a brother. He even bought me a drum machine after I bought my first ‘upper-end’ digital 8-track recorder. He’s the one who turned me on to Kevin Moore (ChromaKey, O.S.I.). ChromaKey (CK) songs hit me right in the middle of the heart the first time I heard them. They shattered me and left me lying on the floor, gasping for breath and wondering how anyone could capture so perfectly what I’d been feeling but hadn’t been able to articulate. The ambient flavor of CK strongly influenced this song. These days he’s become an internationally famous comedian/photographer online. I miss him. I hope one day he hears “Rainbow pt. 1″, catches the drive-thru reference and smiles. But again, I’m not in charge of time. I’m not in charge of anyone else’s choices. I’m actually not in charge of anything but my responses. I don’t get to hold on to any of it. And underneath the initial pain of perceived loss, there’s a real sense of relief in that. This was possibly the second or third song written for the album. Fish Tank Blues was actually the first. I knew that I wanted to do something to play up the whole “Please…call me The Reverend” piece, and since I felt completely free to play (believing, at the time, that no one but Chris would ever hear this anyway) I went over the top with the whole church organ intro. The second section (“I traveled the world over…”) is, once again, largely autobiographical, with creative license to make things a little larger than life. Did I actually travel the world over? Well… I lived in Puerto Rico for three years in the Navy. Did I actually sail the Seven Seas of Rhye? No… but in 1999 I actually did get to spend four hours in a hunting cabin in the woods talking about social justice issues and playing guitar with Brian May and a couple of his friends. And yes, I did think of Chris when I’d go back and visit Austin, and I did try looking him up when I moved back there, and I couldn’t find him. I even thought a couple of times about knocking on his grandmother’s (R.I.P.) door, because she’d lived just down the street from our apartments, but I couldn’t remember which place exactly was hers. And yeah… he actually did end up being in Georgia, studying art in Atlanta. Suddenly, we find ourselves being transported to 80′s dancefloor sounds, which captures for me the vivid image of some of the artist’s wilder moments dancing around his apartment wearing a beat-up cowboy hat and holding a spatula in his hand with the Flaming Lips or Jon Wayne (Texas Funeral) blaring from the stereo. At the time I was more into Steve Vai’s newly-released Passion and Warfare, but Chris kept pushing The Cure my way, and today I can’t help but think of him when I hear these bands. This third section (“Ain’t no sense in searching for The Reverend”)… I wasn’t sure where to take it, so I went for the existential payoff– (“in your heart’s the only place he’s found”). It was a risky path to take; it could be easily taken as a cop-out– a way to avoid actually resolving the story. But the story wasn’t supposed to resolve yet… there are still 7 more songs to hear. And besides, as long as there’s a heartbeat, the story’s never really over, right? Closing section– I’ve performed in kirtan groups in the past, and I love the feel of so many of those chants. I’ve even seen Zakir Hussain live, and had dinner with him after the concert. It was amazing. Choosing this style of music for the closing section also did two things for me. Second, it provided a set of ‘spiritual’ bookends for the song. We start off in some possibly Baptist church somewhere in the bible belt. We end up in an ashram somewhere in India. We’re pursuing something spiritual in both cases… and we’re pursuing it on the 80′s dancefloor, as well… We’re pursuing it as we travel the world over… Ultimately we’re in pursuit of ourselves. I’ve ranted about how shopping on e-bay for that KISS belt buckle I had when I was 12 ultimately ends up being nothing but more of the same– shopping for my past, trying to grab a little piece of ‘me’. And every single time, be it a belt buckle, or a cool shirt, or a whatever, I hold it in my hand and it’s an object. And I haven’t travelled through time. I haven’t captured anything fleeting. I’ve only, hopefully, gotten one step closer to realizing that there’s nothing to capture. I’ve been Searching In Vain the whole time. Okay, here’s where I share my passion for puzzles. But only puzzles of a certain nature… For example, doing my taxes? NOT the kind of puzzle I love. Wearing a purple and green Jerry Garcia necktie with fish that fit together and making it work with my outfit? The kind of puzzle I love. Trying to fix anything under the hood of my car? NOT the kind of puzzle I enjoy. Figuring out Mike Portnoy’s drum fills? The EXACT kind of puzzles I enjoy! So my goal with this song was to do something kind of Dream Theater-ey. I am well aware that I will never be as technically proficient as anyone in Dream Theater, Fates Warning, etc. That’s not my goal here. I’m extremely happy doing what I do during most of my days. “The Unicorn Delivers the News, Ruining What Would Have Been the Perfect Day” is the artist’s title of the cd cover art… so in a way, it’s the perfect chorus for the song. This song is actually a blend of biography, autobiography, and bibliography in that it’s a look at Chris; these observations are through the lens of my experiences; and the song ends up referencing a number of Chris’ paintings and shows… Third and Congress… Arby’s parking lot on Burnet… Backyard fish fry (true story)… Double Vision… Highways Again… the song ends up being a sort of snapshot of Chris’ artistic resume. Why do I care so much about Chris’ art? There are a zillion artists in the world, all creating, all struggling, all succeeding in one way or another and all learning… so why Chris Chappell? Two words: ‘toilet portraits’. As I sit and write this, I’m glancing up at the portraits, and I can only say that the combination of mad court jester with sober survivalist who has managed to channel his energies away from self destruction and toward artistic creation brings about in me a sense of respect, admiration and awe. And the art blows my mind. Fish Tank Blues, it turns out, is strongly autobiographical. The story is actually more true than many may think. It really did start down on Manchaca, which actually is a winding road between Ben White and Lamar. And she actually did give me back the engagement ring I’d gotten her, at the wise old age of 20, leaving me with the apartment and the rent payment. 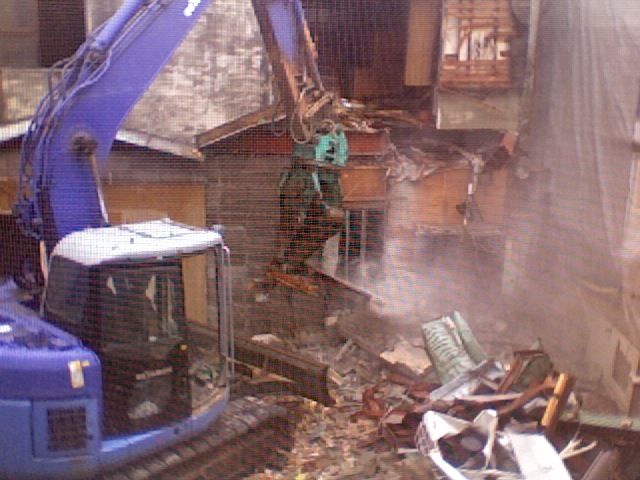 The only option I saw was to get a smaller apartment at the same complex, and while carrying all my belongings across the parking lot, I actually did see some long-haired guy cleaning out his fish tank. And I went over to say ‘hi’, and he introduced himself, and quickly followed up with, ‘but call me The Reverend.’ And now, almost 20 years later, he’s truly become The Reverend. MacBook laptop, Korg Triton, Shure SM-58, M-Audio FireWire Solo, CA Guitars “Legacy AE” acoustic guitar and Whirlwind cables. Special thanks to Chris Chappell and to Michael Schliefke, both prolific Austin artists who have influenced the cd in one way or another. The entire album was inspired by two oil portraits by Chris Chappell , both portraits whose subject matter happened to be commodes of my abodes (both in Takamatsu, Japan and in Durango, Colorado). Chris is happy to accept custom orders, but you’d better e-mail him and see what his availability is. These days, there’s a waiting list for his work. You’re also going to love Michael Schliefke the Human’s work: www.schliefkevision.com. While you’re at it, no afternoon is complete without some ChromaKey . You go now. “To me, painting is sort of like journalism in a way, I just record what I see itself. It’s why I paint from life now, not literally sometimes if I work from photos, but of actual things opposed to abstract or made up. 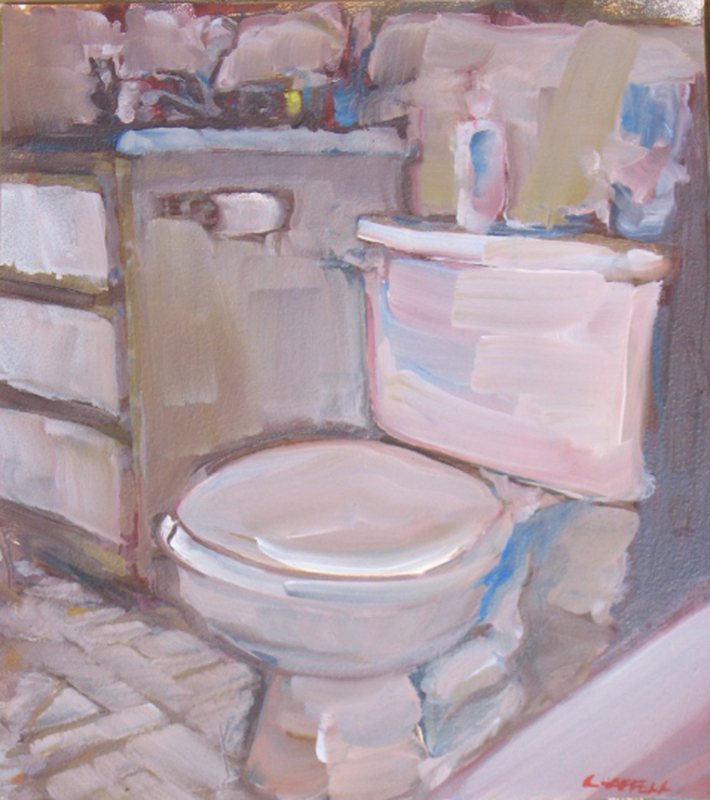 A reason I paint toilets in the first place that they often are symbols of something (in this case hatred), they are often something you see or use daily and take for granted. Also they’re weird in shape, interesting in form, and anyone is expert enough draw one from memory. You see them so much in life that you can actually recreate an image of one without looking at a reference. Go on try. You may not be practiced at drawing, but you can figure out where everything goes. Or if you prefer try drawing a guitar without reference- I guess the point being that there is an actual image in one’s mind. I’m trying to explore the part of my memory that holds images of insignificant things. On Friday, October 24, my completed cd order arrived from DiscMakers…precisely the day they had projected. I could not be happier with their service and product. These guys are really great. I highly recommend them to anyone considering cd replication. The service was outstanding– I received responses to my e-mails within the day every time, and 95% of the time within minutes of sending my question. It felt like customer service the way it is supposed to be– not just what the customer will put up with. I look forward to working with them again and again. So yesterday afternoon was spent packaging a small run of the cd’s, shrink-wrapping them, and getting shipping materials ready. The Blue Genie Art Show in Austin, Texas happens in early December, and I’m excited to be sending copies of the disc to Austin artists Chris Chappell and Michael Schliefke, both of whom will be showing at the event. They’ll be selling copies of the cd at their respective booths. If you’re in the East Austin area this December, be sure to make your way over to Blue Genie. It’s right by the railroad tracks, and well worth the visit. 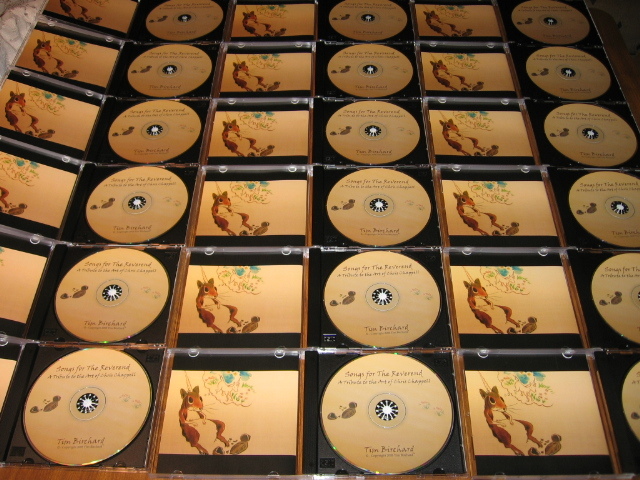 I’m also sending a batch of cd’s to CDBaby (www.cdbaby.com/cd/timbirchard) for online sale. CDBaby will also be offering Songs for The Reverend as digital downloads, for those who aren’t into liner notes. Hopefully these downloads will find their way to iTunes and other major outlets. Today will also be about filling all the pre-paid orders that have been made in the past few months while the brownies were still in the oven. Special thanks to all of you who helped strengthen the intention by sending early payment. Your cd’s will be in the mail this upcoming week. Austin artist Chris Chappell has been my friend since before he was “Austin artist Chris Chappell” and was simply “Chris.” And I’ve wanted to release my own album since I was about 7 years old and saw an episode of “3-2-1 Contact!” that was all about one guy recording all the different parts of his album by multitracking. How these two aspects converged, I’ll never really know… truth is stranger than fiction. After finishing my B.S. at U.T., I joined the Navy and left Austin. I bumped into Chris about two years later, then lost touch with him. Fast forward 13 years to 2006 and I walked into the art show at Blue Genie, and there he was, with a wall of his art behind him. It was one of those surreal moments where you look up and meet the eye of someone you think you recognize, you both stand there for a moment staring at each other, then it clicks and you both start laughing. I was overjoyed. It was great to get reacquainted, and I was of course blown away by his art. Since I’d last seen him he’d moved to Georgia and studied at a prestigious art school in Atlanta, returned to Austin and started a family. Now he has a show at Austin’s Davis Gallery… no small feat. At his home studio he was showing me some of his work, and he had a collection of portraits he’d done of commodes. 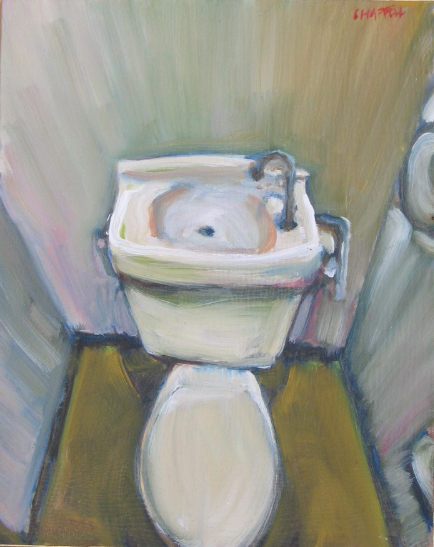 I begged him until he finally agreed to paint me a portrait of my commode. 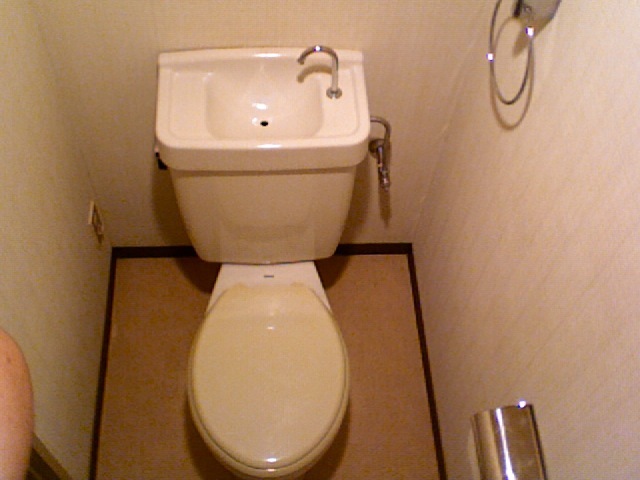 Since I was leaving within weeks for Japan, I decided I’d e-mail him photos of my Japanese commode. And that’s just what I did. Successful artists stay busy, and Chris is no exception. I got back from Japan in August of ’07, and he still hadn’t gotten around to completing my toilet portrait. So I followed up with photos of my Durango, Colorado commode. He surprised me by doing portraits of both commodes and shipping them to me post-haste. I was so thrilled, I promised him I’d ‘write him an album’. The first song came out almost effortlessly, and another one shortly followed. This was March of ’08, and I knew that I had about three weeks left before my new full-time job started, so I had the time and space to sink into the writing/recording process. The more I wrote, the more I realized that there were still stories left untold, and new songs continued to peek out from behind the curtain and slowly, tentatively, introduce themselves to me. Initially I pulled from my personal experiences with Chris. Then I revisited his websites (chrischappellart.com and chrisatelunch.com… sadly, stinkyearl.com is no longer up) and just enjoyed strolling through his blog entries, his photos… his take on life for the past few years. And I discovered more songs waiting to be written. By the beginning of April, Songs for The Reverend was complete. I wrote and recorded everything at my home studio, with only my Composite Acoustics “Legacy” acoustic guitar (also a favorite of Dean Parks! ), Cheryl’s Korg Triton keyboard, my SM58 and my MacBook. While this was by no means my first collection of songs (Cheryl and I wrote/co-wrote some 96 songs during the year that I was in Japan, and during that same time I wrote “Dragonfly” which I still need to get mastered and released…) it IS the first that I have actually taken in to be mastered. Scott Smith of “Scooter’s Place” here in Durango, CO did an amazing job on my project, and is credited with a number of excellent albums. Great guy, knows his stuff, and has a great sense of humor, as well. Check him out at http://www.scootersplace.com. I’d end up pulling out all my hair if I’d had to sit down and Photoshop the project together, so I called upon another friend, Scott Kadera of Kadera.com (www.kadera.com) to take care of the layout/design for me. (Scott has been my friend since 1977, when we were both in 3rd grade. This is a fact I enjoying sharing with anyone and everyone who will listen as we walk down the street to get a burger. How/why he still tolerates me, I’ll never know.) Scott did a fantastic job and I could not be happier with the results. My friend Nacho Blasco, who hails from Spain and lives with his wife in Utazu, Japan, also helped out with some graphic design ideas while I was still in the early stages of trying to figure out what the final product might look like. 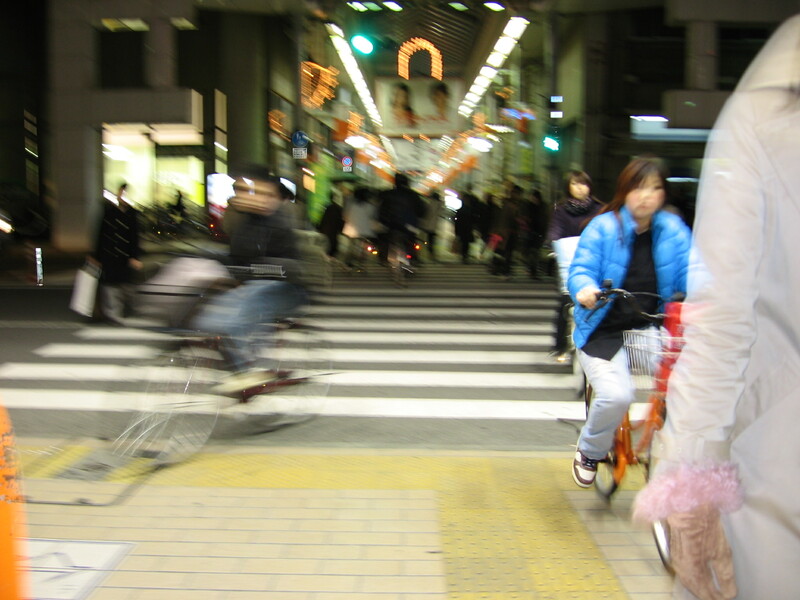 Nacho has some hilarious observations about life in Japan as a Spaniard. But that’s another story. Rainbow Printing, here in Durango, took excellent care of all the print work. I decided to go local on the cd inserts, use DiscMakers for the replication (1000 copies bulk– first run) and simply do small print runs on demand. This means I’ll be assembling/packaging the product by hand… so they truly are hand crafted with love. So now the project is in New Jersey, being replicated (not duplicated). The completion date is set for Oct. 24 (this Friday), and then add a few days for shipping. I hope to have copies ready for sale by Halloween. I plan to sell via CDBaby, timbirchard.com, Southwest Sounds of Durango, as well as at shows, though my work with young adults trying to further their education keeps me busy and then some. Another dream for me is to have this album pressed to vinyl… now THAT would be cool. Or let me say, “That WILL be cool” to set the intention. And my friend Sunny, now up in Washington state, loaned me his sweet little powered monitor speakers. That made ALL the difference in the creative process. Deepest thanks to everyone I mentioned in this entry. And thanks to you for reading this and for hopefully checking out Chris Chappell’s art and my tribute to it. Brush Strokes: Extremely relaxing. Original melody. It surprises me, it relaxes me. The rhythm of this song also gives me pleasure. Me gusta todo, MUCHO. Will there even be a rainbow 1: I really love how you are intentionally all the time close to the cacophony in this song but you always end up respecting the rules of the music, which I don..t know well… but I clearly notice when a song breaks them and when not. Will there even be a rainbow 2: Very original. I don..t like that organ you play at 00:50 tho. Anyway I love the bizarreness of this song, including the sudden end, which is just extremely elegant. Canvas: Hypnotic. Pleasant. I specially enjoy the guitar on the background, and I think the electric guitar solo should be eliminated or toned down some way. Some times, some of your solos are too flashy for my taste in this and other songs. Fish Tank Blues: The melody and the rhythm sounds too typical to me. I find this song childish. Human in my yard: I don..t know well, but I guess it is like the typical melody designed to make happy some female teenagers of the 80..s of some small village in Utah. I don’t like this song at all. It makes me vomit, specially when you go lalala. It makes me hate you. Really. On 10/23/08 Eiichi Nishio of Japan wrote:Your song is good! I like your song, especially first song. Oct 10/27/08 Max of Colorado, USA wrote: So… your music review is coming in pieces whether you like it or not. Brush strokes – Definitely dig it, you can’t go wrong with melodic instrumentals Human in my yard – Reminds me of earlier Beatles or Syd Barrett era Pink Floyd. P.S. Do you like the Flaming Lips? review coming soon, also in pieces. you kept me company on my commute today, i was rockin out. On 11/14/08 Nacho of Utazu, Japan wrote: Send me your CD and I’ll review the other six songs. Don’t worry, I’ll let you know if they stink. By the way, maybe you and your potential customers will appreciate to know that “Will there even be a rainbow Part 1″; is extremely addictive, especially after drinking half a bottle of Baron de L’Estac. By the way, I give you five stars because your 1st 2 songs absolutely deserve them. On 11/15/08 Mark of Iowa, USA wrote:SWEET. LOVE THE ANIMALS & PIPER/GATES/DAWN INFLUENCE A GREAT DEAL. I am really enjoying yor web site. Wish I could have got en to know you better. Keep up the good work. Grampa Harold may not understand all your stuff, nor doI, but you are certainly a great mind and artist.